In the seventh installment of Coren’s Arthur series, young Arthur William Foskett is travelling alone on a transatlantic sailing, headed back to school in England. The early days of the voyage are plagued by bad weather, and most of the ship’s passengers take refuge in their cabins, leaving the dining room to just Arthur and two other men, who turn out to be none other than Mr. Sherlock Holmes and Dr. John Watson. Even after the weather clears and the passengers re-emerge, it’s hardly smooth sailing for the S.S. Murgatroyd, as there is a robbery on board. Not to worry, though: Sherlock Holmes and Arthur Foskett are both on the case. This is a charming, very funny mystery for young readers, with plenty of amusing references for those already familiar with Holmes. 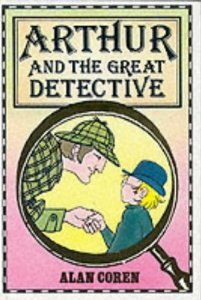 I haven’t read any of the earlier books in the series, but I’m going to be keeping an eye out for copies of Arthur and the Bellybutton Diamond and Arthur and the Purple Panic, both of which also feature Holmes and Watson, and neither of which are held by my library.